Mets catcher Travis d&apos;Arnaud and Pablo Sandoval watched the flight of the third baseman’s sixth-inning double off Jacob deGrom. NEW YORK — Jacob deGrom learned Saturday what so many other ace pitchers have this season: It’s inexplicably difficult to beat the last-place Red Sox. DeGrom took the loss in a 3-1 Red Sox victory over the New York Mets. Like they have done against Chris Archer (twice), Johnny Cueto, Sonny Gray, Scott Kazmir, Corey Kluber, Shelby Miller, and Justin Verlander, the Red Sox found a way to beat a star. Mookie Betts isn’t sure what the reason is. 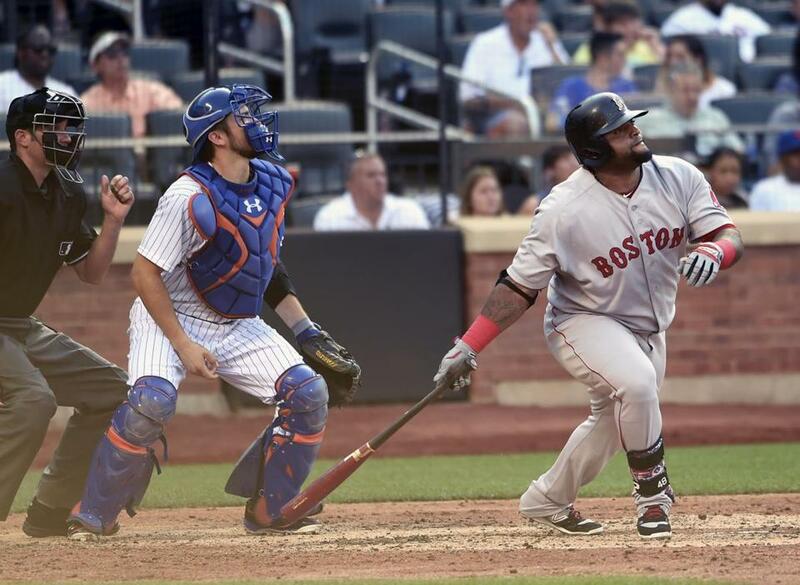 David Ortiz was not in the lineup, in part because of tightness in his left heel. He pinch hit in the ninth inning against 42-year-old Bartolo Colon, swung at the first pitch he saw, and drove a rocket to center field. Ortiz missed a home run and was nearly out at second when third baseman Juan Uribe sneaked up behind him. Ortiz nimbly avoided the tag. Ortiz said he expects to start Sunday. He demonstrated how he was feeling by doing a few salsa steps before leaving the clubhouse. “That’s how I was safe,” he said. The double gave Ortiz 572 for his career, tying Ivan Rodriguez for 24th all-time. Ortiz reached 500 plate appearances Friday. That guaranteed his contract for $13 million next season. Ortiz needs 24 more plate appearances for $14 million and can get to $16 million with 600 plate appearances. Ortiz is on pace for 632 plate appearances. Red Sox president of baseball operations Dave Dombrowski met with Lovullo and the coaching staff before Saturday’s game against the Mets. Among the topics were what players to call up when rosters expand Monday. The Red Sox have two spots open on their 40-man roster and can create another by shifting Koji Uehara to the 60-day disabled list. He has a broken right wrist and will not return this season. “We haven’t yet firmed anything up. There are going to be some call-ups. That’s for certain. When that happens we haven’t determined yet,” Lovullo said. Along with pitching, Lovullo said he wanted a third catcher and a middle infielder. Catcher Sandy Leon (who would need to be added to the 40-man roster) and middle infielder Deven Marrero are leading candidates to return. Available relievers include Jonathan Aro, Matt Barnes, Noe Ramirez, and Edwin Escobar. All have major league experience. “The catching thing is what we were talking about,” Lovullo said. Hanley Ramirez (right shoulder) missed his second straight game. “My gut feel is he’s going to be ready sooner or later. I know that he wants to play,” Lovullo said. “I think we have to be smart moving forward.” Ramirez has missed 11 of the last 19 games with injuries. As Ramirez recovers, his workouts at first base have been temporarily suspended . . . Junichi Tazawa was unavailable after throwing 30 pitches Friday. He also had a sore right hip and groin after twisting awkwardly to field a comebacker. He could return Sunday. Catcher Ryan Hanigan (left calf tightness) was scratched from the lineup during batting practice. Blake Swihart replaced him. Lovullo said the Red Sox are considering a six-man rotation for at least part of September. That would help control the innings for rookies Henry Owens and Eduardo Rodriguez. In that scenario, Barnes could start again . . . Alejandro De Aza, who has played little in recent weeks, started in right field and was 0 for 3 with a walk. The veteran is a candidate to be traded in the coming days. Contending teams have until Monday to add players who would be eligible for the postseason . . . Tennis legend John McEnroe threw out the first pitch. The US Open starts Monday. The Billie Jean King National Tennis Center is a three-minute walk from Citi Field . . . The Mets chose the series against the Red Sox to remember their 1986 World Series champions. Fans on Saturday received a bobblehead doll of Jesse Orosco celebrating the final out. That was a strikeout of Marty Barrett . . . The Mets picked up bullpen help, agreeing to a trade with Arizona for former closer Addison Reed, pending a physical, according to an ESPN report . . . The Red Sox are 194-145 (.572) in interleague play, 10-6 this season. Only the Yankees (199-138, .591) are better.